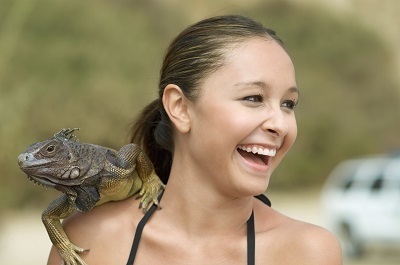 While reptiles are not necessarily cuddly, they do make good pets for some households. Reptiles like lizards, snakes, and turtles are interesting creatures that each have their own personalities. Since these pets require less maintenance and care, they are a good choice for families with younger children and busy households. Each type of reptile does have some specific needs that may seem unusual to new owners, though. For example, many of these pets require live food, anything from crickets to white mice depending on the species. On the plus side, most reptiles do not need to be fed every day. Another important requirement is a particular type of heating element in the cage, whether a light or heat mat. This blog provides in-depth details about how to set up a reptile habitat and care for your reptilian pet throughout its life. Small types of lizards are particularly popular among children including geckos, bearded dragons, and chameleons. These pets are also learning tools as children learn about the characteristics of reptiles and how they differ from mammals. Children can use their creativity to add items to the reptile’s cage that more closely resemble its natural habitat.